When you need Asian auto maintenance in Austin bring your vehicle the auto shop that has the experience to solve any problem you're having. Oak Hill Automotive has been servicing Asian autos since 1991 and there is no job that is too big or too small for our professional crew of certified technicians. Whether you need suspension repair, starter or alternator replacement, muffler repair, electrical diagnostics, AC service, an oil change or any other repair other repair or service remember that we are a dealership alternative in Austin that is able to complete factory scheduled maintenance and complex engine and transmission repairs. 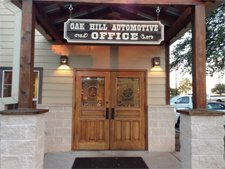 To schedule an appointment for expert Asian auto repair in Austin call Oak Hill Automotive today! One of the most important systems on any vehicle is the cooling system. Vehicles are equipped with a cooling system in order to prevent the engine from overheating, which could cause major internal damage should it occur. The cooling system is made up of a series of hoses, a water pump, a fan and a radiator. It uses a cooling liquid called coolant, often referred to as antifreeze, that is pumped through the engine to keep temps down. If you have had overheating trouble or noticed a possible coolant leak give us a call today so we can keep your vehicle healthy! The brakes are the most important safety feature of your vehicle. If you have trouble stopping or experience signs of brake trouble such as a grinding or screeching noise when braking, a soft brake pedal or if your car pulls to the side during braking be sure to get it to our repair shop right away. It is up to you to keep your vehicle safe! To have your Subaru, Nissan, Scion, Kia, Hyundai, Lexus or any other Asian auto serviced call at Oak Hill Automotive! We offer professional Asian auto repair in Austin and most services are offered with a great warranty!